The manually tunable fibre grating, model number OETFG-100, is a wide tunable range, simple structure, high sensitivity, long life time product fabricated with O/E Land Inc proprietary technology. The tunable fibre grating can be used as dynamic add/drop, wavelength router/switch, tunable fiber laser, dynamic dispersion compensation fiber grating, dynamic gain flattening, tunable fiber laser, fiber sensor system, biomedical, instrument and other applications. The manually tunable filtre uses fibre Bragg grating technology and, when available, an optical fibre circulator to provide a bandpass signal to the output port. Circulators are readilty available at the 1060 nm, 1310 nm and 1550 nm ranges. 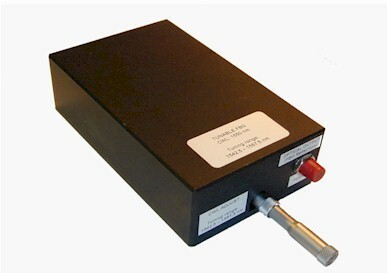 For other wavelength ranges, please inquire about customized solutions. A bandstop option, without circulator, is also available. In the bandstop version, the bandpass signal is reflected back into the input. The wide range manually tunable fibre grating is based on proprietary technology with US patent number 6,360,042.